This product may seem pricey on the surface, but when you think about everything it does it is in actual fact fantastic value. This products means there is no need to invest in new eye shadow shades as you can spice up old colours with this eyeshadow intensifier. The idea is to add a drop of du wop to your old dull powders and just like magic you will have a new and improved creamy shade! You can also use Du Wop to transform your old shadows into liquid eye-liners which means you now have a triple whammy of things you can do with your eyeshadows. A simple beauty trick is to mix power shadow or glitter pigment with a little water, or simply to dampen your applicator brush before applying for a more intense colour. This does work but the staying power isn’t great and will definitely not last an average working day without a number of touch ups. 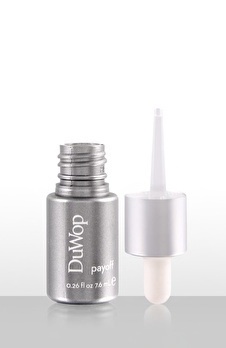 DuWop on the other hand creates longer lasting colour which will see you all the way through the day.